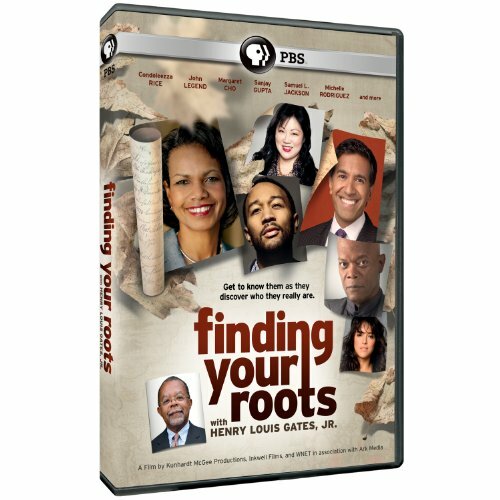 Arlington, Va. - June 15, 2012 - PBS Distribution today announced it is releasing Finding Your Roots With Henry Louis Gates, Jr on DVD. The basic drive to discover who we are and where we come from is at the core of Finding Your Roots With Henry Louis Gates, Jr , the 12th series from Professor Gates, the Alphonse Fletcher University Professor at Harvard University and director of the W.E.B. Du Bois Institute for African and African American Research. Continuing on the quest begun in his previous projects, "African American Lives" (2006), "African American Lives 2" (2008) and "Faces of America" (2010), Gates finds new ways to, as he says, "get into the DNA of American culture." In each hour-long episode, he takes viewers along for the journey with two or three celebrity guests who are connected to one another by an intimate, sometimes hidden link, treks through layers of ancestral history, uncovers secrets and surprises in their family trees and shares life-altering discoveries. Finding Your Roots will be available on DVD July 17, 2012. The run time of the program is 600 minutes and it comes on three discs. The DVD SRP is $39.99. "Finding Your Roots will be a moving, uplifting, entertaining and enlightening experience for viewers," says Gates. "Genealogy is more popular than ever, but it's far more than a solitary pastime. It's a fascinating endeavor that can drastically alter both history and the way we think of ourselves." Guest groupings include award-winning husband-and-wife actors Kevin Bacon and Kyra Sedgwick, who both descend from prominent American families that have been in this country since inception; New Orleans jazz masters and close friends Harry Connick Jr. and Branford Marsalis, who both had European ancestors who immigrated to the slave-era South in 1850; spiritual leaders Angela Buchdahl, Yasir Qadhi and Rick Warren, whose ancestors' paths to America were shaped by religious convictions; and education superstar Geoffrey Canada and media legend Barbara Walters, who both rediscover family histories long obscured by forgotten name changes. In other episodes, public servants Condoleezza Rice and Congressman John Lewis, featured in different hours, trace their contemporary-day strength to enslaved ancestors; actor Robert Downey, Jr. marvels at the vastness of his family tree dating back to the 13th century; and Michelle Rodriguez discovers family secrets and heroes that her parents left behind when they came to the United States as immigrants. Gates travels with his guests throughout the series, sharing the details of ancestral stories and helping process what they've learned. He accompanies musician John Legend to a rock concert, goes backstage on Broadway with Samuel L. Jackson, joins Newark, New Jersey, Mayor Cory Booker as he reveals the root-seeking results to his parents, and trails CNN chief medical correspondent Dr. Sanjay Gupta and Geoffrey Canada to memorable family reunions. The 25 guests featured in the series are Kevin Bacon, Cory Booker, Angela Buchdahl, Geoffrey Canada, Linda Chavez, Margaret Cho, Harry Connick Jr., Margarett Cooper, Robert Downey, Jr., Adrian Grenier, Sanjay Gupta, Maggie Gyllenhaal, Samuel L. Jackson, John Legend, John Lewis, Branford Marsalis, Yasir Qadhi, Condoleezza Rice, Michelle Rodriguez, Kyra Sedgwick, Ruth Simmons, Martha Stewart, Wanda Sykes, Barbara Walters and Rick Warren. Working closely with leading U.S. genealogists (including Johni Cerny, co-author of the acclaimed The Source: Guidebook for American Genealogy and staff of the New England Genealogical Historical Society) and ancestry experts from around the world, Gates and his production team comb through family stories to discover unknown histories and relatives the guests never knew existed. When paper trails end for each story, the team turns to top geneticists and DNA diagnosticians (such as the genetic testing services 23andMe, African Ancestry and Family Tree DNA) to analyze each participant's genetic code, tracing their bloodlines and occasionally debunking their long-held notions and beliefs. Reaching beyond celebrity stories, Gates also seeks out everyday individuals (on-air and online) who are wrestling with questions of identity. He visits with employees at his favorite barber shop and engages Harlem students who are curious about their genetics. A far-reaching educational and community outreach initiative will accompany the broadcast, including locally produced short excerpts to be shown on partner stations in conjunction with "FINDING YOUR ROOTS;" a set of standards-based lesson plans for upper elementary and middle school classrooms that use segments from the series; live webinars; and a multi-media guide for educators to encourage use of the series and its additional resources with students. "FINDING YOUR ROOTS WITH HENRY LOUIS GATES, JR." is a production of Kunhardt McGee Productions, Inkwell Films and WNET in association with Ark Media. WNET is the parent company of THIRTEEN and WLIW21, New York's public television stations and operator of NJTV. For nearly 50 years, WNET has been producing and broadcasting national and local documentaries and other programs for the New York community. Henry Louis Gates, Jr., Stephen Segaller, Peter Kunhardt, and Dyllan McGee are executive producers of "FINDING YOUR ROOTS WITH HENRY LOUIS GATES, JR." Rachel Dretzin is senior producer. Leslie Asako Gladsjo is senior story editor. Corporate funding is provided by The Coca-Cola Company, Johnson & Johnson, McDonald's and American Express. Additional funding is provided by the Carnegie Corporation of New York, The Atlantic Philanthropies, Ford Foundation and the Pew Charitable Trusts. Support is also provided by The Corporation for Public Broadcasting (CPB) and PBS. New York's WNET is America's flagship public media outlet, bringing quality arts, education and public affairs programming to over 5 million viewers each week. The parent company of public television stations THIRTEEN and WLIW21 and operator of NJTV, WNET produces and presents such acclaimed PBS series as Nature, Great Performances, American Masters, Need to Know, Charlie Rose and a range of documentaries, children's programs, and local news and cultural offerings available on air and online. Pioneers in educational programming, WNET has created such groundbreaking series as Get the Math, Noah Comprende and Cyberchase and provides tools for educators that bring compelling content to life in the classroom and at home. WNET highlights the tri-state's unique culture and diverse communities through NYC-ARTS, Reel 13, NJ Today and the new online newsmagazine MetroFocus. Inkwell Films was founded by Henry Louis Gates, Jr. to produce sophisticated documentary films about the African and African-American experience for a broad audience. Currently in production, Finding Your Roots, a 10-hour series for PBS. Most recently Inkwell Films has co-produced Black in Latin America (2011), Faces of America (2010), Looking for Lincoln (2009), African American Lives 2 (2008), Oprah's Roots (2007), and African American Lives (2006), Inkwell Films is currently developing Many Rivers to Cross: The History of the African American People, a six-part series for PBS. Ark Media is a documentary film company founded in 1997 by the producing team of Barak Goodman and Rachel Dretzin. Ark's mission is to produce documentary films characterized by rigorous reporting, careful craft, and imaginative filmmaking. Ark partnered with Kunhardt-McGee Productions on the Henry Louis Gates Jr. series, Faces of America, (2010) and also with Kunhardt-McGee, produced Looking for Lincoln (2009) and the upcoming Makers project for PBS. For the last decade and a half, Ark has produced films primarily for the PBS series Frontline and American Experience, winning nearly every major broadcast award: the Emmy, DuPont-Columbia, Robert F. Kennedy, Writers Guild and Peabody Awards, as well as earning an Academy Award nomination and official selection to the Sundance Film Festival. Ark has also produced documentaries for the New York Times, American Movie Classics, ABC, and the History Channel. For more information, visit www.ark-media.net.